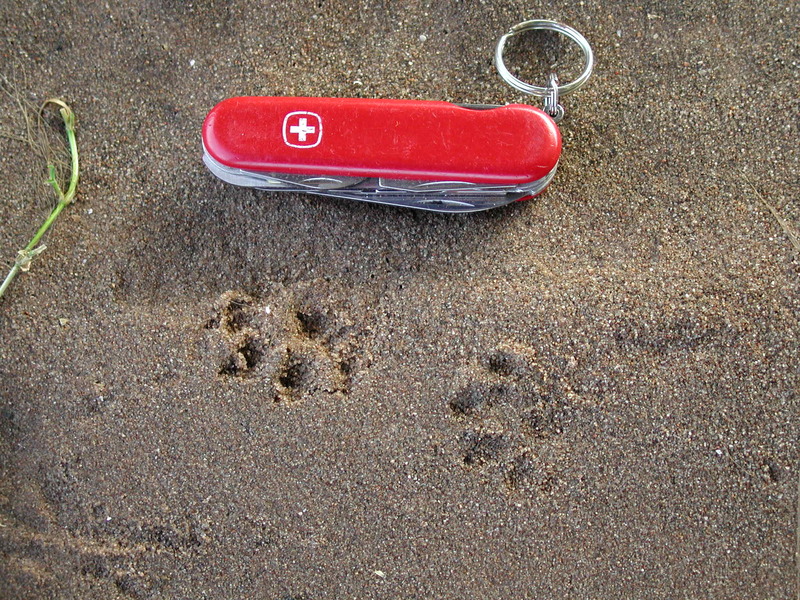 Why look out for animal tracks? Ecologists rely on animal signs to help them understand the numbers, behaviours and movements of species. Such animal signs include calls, burrows, leftover meals, territorial markings, fur, droppings and tracks. 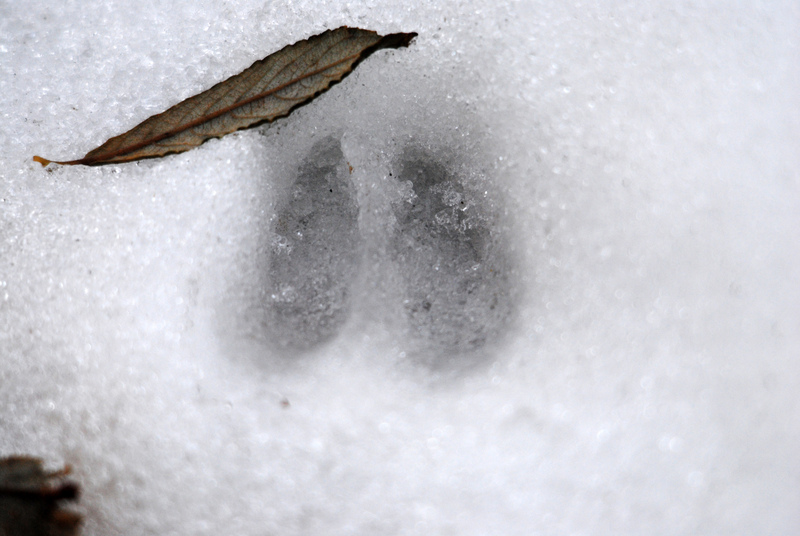 You can encounter animal tracks anywhere – in city parks, in your garden or in rural countryside. It is easiest to spot them in muddy places, or when it has snowed. Or you could try setting up a footprint trap! Leave a sand-filled tray outside your house overnight and see who’s been to visit in the morning. Whose tracks have I found? Here are some animal tracks you might come across - click on the photos to see the full size images. Remember take a note of the size and shape, and the number of toe or ‘claw’ marks you can see. A photograph can be a handy way to help identification back at home! Prints are very robust and broad (6.5cm wide). They show long claw marks and have five toe pads in front of a wide rear pad. 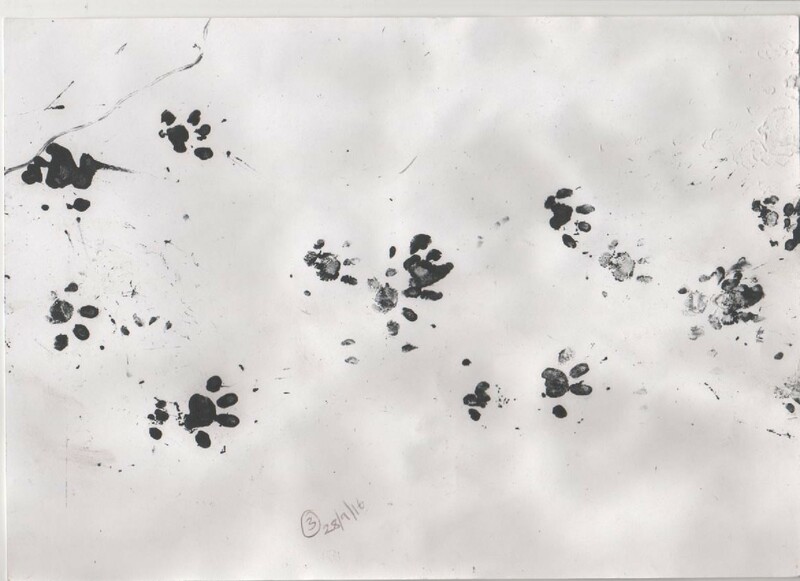 Their front and back paws differ slightly: the front-paw marks have longer claw marks, while the back-paw marks show the inner toes to be a little further forward. Deer prints have two oblong and pointed toe impressions that sit alongside each other, making the shape of an upside-down heart. Different species of deer can be hard to tell apart, but generally, the diminutive muntjac leaves tracks that are about 3cm long, while the impressively large red deer leaves tracks up to 9cm long. The tracks of sheep are similar but tend to be much more rounded at the top. 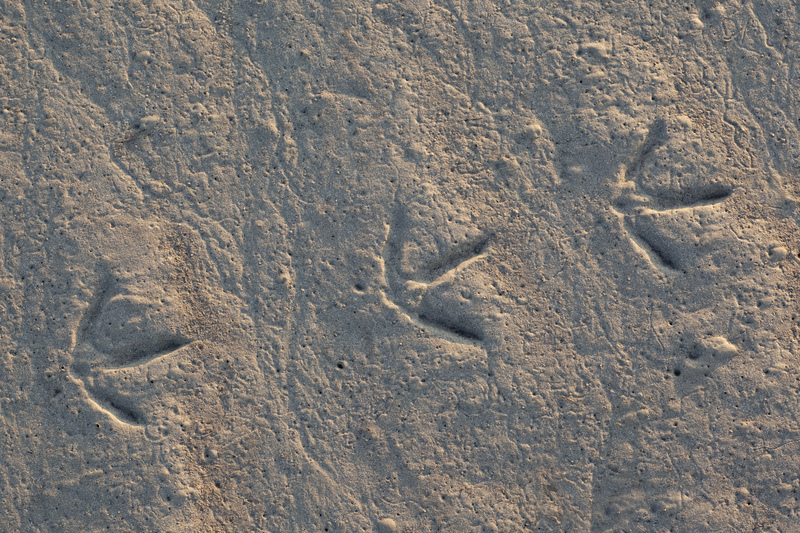 Footprints are webbed and large (up to 9cm long and 6cm wide), with five toes and a large rear pad impression. 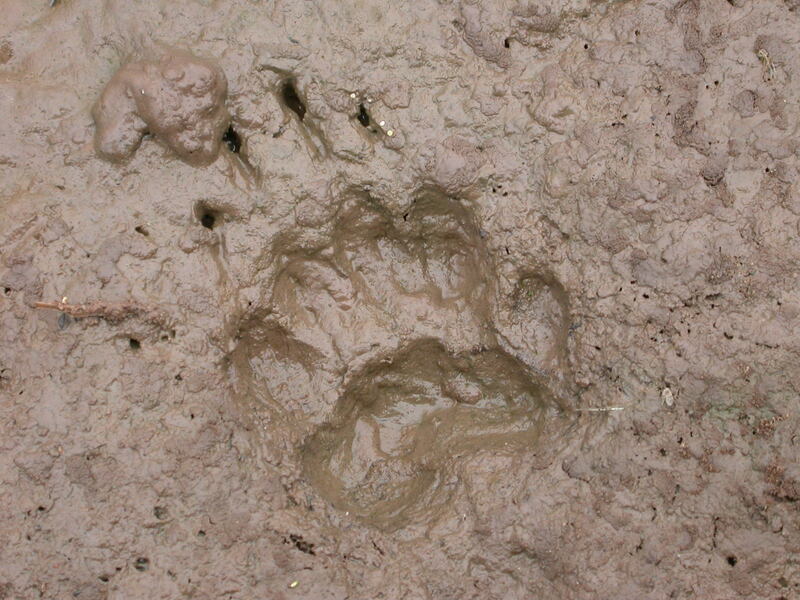 Claw marks aren’t usually visible, and sometimes only four toes imprint, but if it’s a muddy area, you might just see the distinctive ‘drag’ of a tail. Quite similar to otter prints, they show five toes in a splayed, star shape. 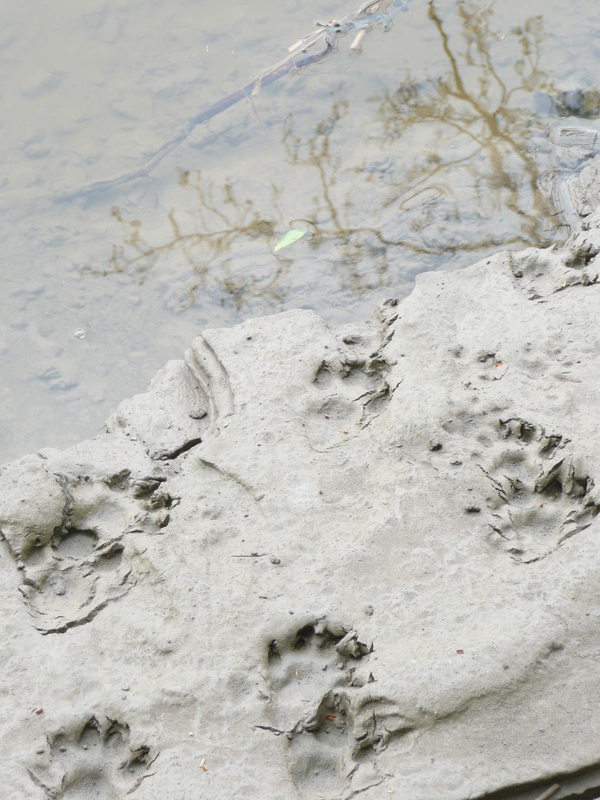 Claw marks may be visible, but the big difference between these and otter prints is size: mink, weasel and stoat prints range from just 1-4cm, while otter prints are a massive 9cm long. 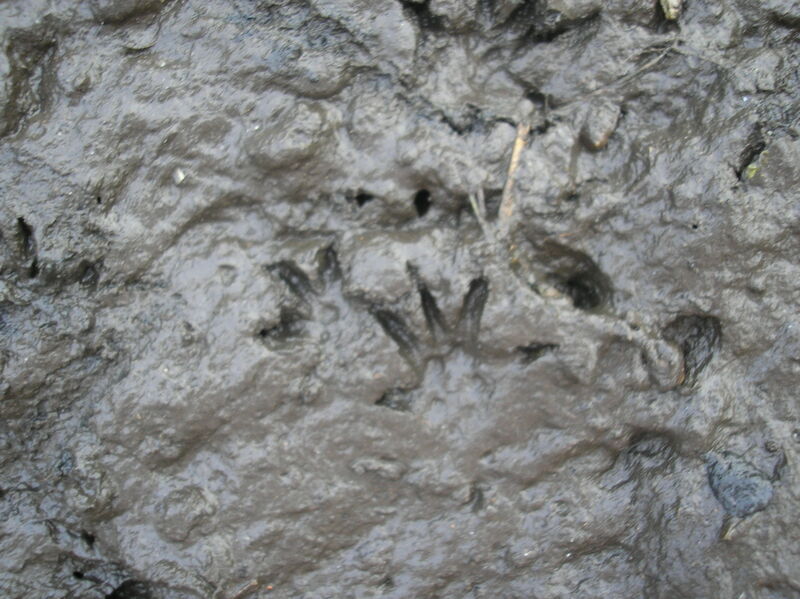 Water vole prints show five toes and can easily be confused with rat prints. However, the hind feet of water voles show a distinctive splaying (star shape), with the two outer toes at right angles to the three inner toes. Water vole prints tend to be about 3.5cm long with short heels. The toes in the hind feet of rats all sit parallel, and prints tend to be 4.5cm long with long heels. Prints are long and narrow, with three toes pointing forward and two outer toes that point to the side, making a star shape. Sometimes, only four toes are visible in the print. Hedgehog prints are approximately 3cm wide and 2.5cm long. These prints are quite easy to tell apart, but determining specific species is a different ball game! Duck prints have three claws with visible webbing in between them, while bird prints show a long middle toe, two shorter and splayed outer toes, and a long backward-pointing toe. Sparrows have small prints that appear in pairs because they hop, while pigeons have larger prints that alternate because they walk. Swans display prints like ducks, but just much larger! Wader prints (pictured) are similar to duck prints, just without the webbing, and are disproportionately large in relation to body size. They also tend to walk in straight lines, with one foot in front of the other. Found more than just animal tracks? Take a look at some common British mammal droppings you have might come across, as well as some tips of what to look (or smell!) for.